Welcome to the Vengeance Cover Reveal Week Blog Hop! Vengeance is the second installation of the Transcend Time Saga, which started with my debut novel, Remembrance. In Remembrance, high school junior Lizzie Davenport has been reincarnated from Regency Era, England, but she doesn't realize it until she meets her soul mate for the first time and he triggers her memories to gradually return to her. If you haven't read Remembrance yet, you can check it out on Amazon, Barnes & Noble, and The Book Depository. Also be sure to add it on Goodreads! Each day this week, a different Young Adult book blog will feature a puzzle piece of the Vengeance cover, a fun fact about Vengeance, and an interview question answered by myself. At the end of the week (Friday, October 21), the full cover will be revealed on my blog. Vengeance also has a Goodreads page, so be sure to check it out and add it to your to-read list by clicking here! I'm sure you're wondering -- which blogs should you visit to see each puzzle piece as it's revealed? Well, here is the list of the awesome bloggers who are participating in the Cover Reveal! Friday, October 21: Return to my blog to see the full cover revealed! And there are LOTS of ways to win!!! Very awesome giveaway. I will have to make sure to check out every blog to see each piece of the Vengeance cover since Remembrance has such a lovely cover. OMG! OMG! This is an amazing giveaway! Thank you so much! :) I love the mask, it would be very useful next Halloween ;) And BOTH books SIGNED! I mean thank you for taking time to do that! And thanks for this giveaway! Wish me luck. Wow, Michelle, quite the extravaganza! So happy for all your success! @Fred: Thank you, and I appreciate how enthusiastic you are about my writing! Hi Michelle. What a fun contest. I can't wait to see the cover. I love the cover for Remembrance. also when i entered in the +1 for following you on twitter...I accidentally pressed i did this without giving you my twitter name which is @TessMWatson sry bout tht!! And seriously, signed books! *SQUEE! * Thanks so much for the giveaway! I have not had the pleasure to read the first book but I look forward to reading them both Michelle. Congrats on your release. Wow! Thanks for hosting such a great give-away! O M Goodness! You are so so generous! Thank you :) thank you!! :D Wow, I would die so happy if I won this! Thank you for the chance! 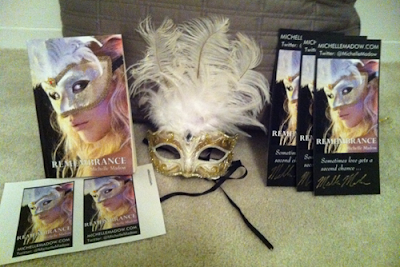 The mask is beautiful as well as the (signed!? <- read: squee! )books :) Good luck everyone and here's to begging the universe to let me win! This extremely generous thank you!! This is so exciting! Thanks! This is awesome! I have been trying to get my hands on this book since I don't own an E-reader (I know, sad). Thank ya for the great giveaway. Can't wait to see the new cover. I cant wait to see the cover! I loved Remembrance! I thought I left a comment here... Guess it did not publish!? Love the blog hop reveal!! Although it gets harder to wait each day!!! Thank you so much for the giveaway and the chance at winning your amazing books! Great contest! Cant for the life of me figure out how 2 enter. Lol.